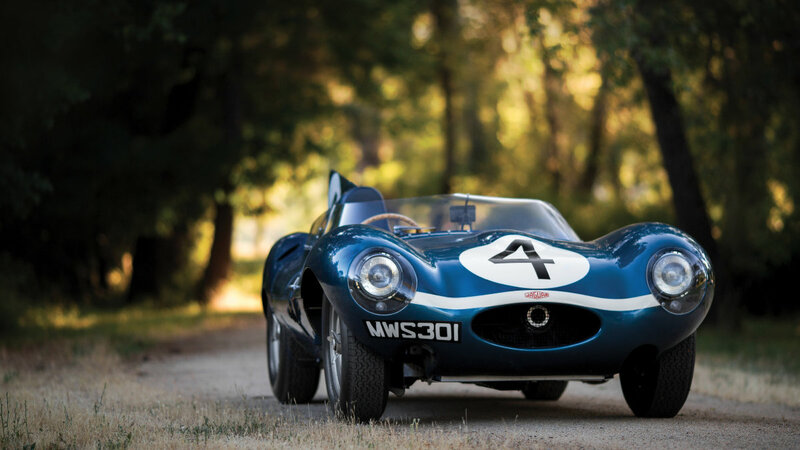 The 1956 Le Mans winning 1955 Jaguar D-Type XKD501 is the headline entry for the 2016 RM Sotheby’s Monterey classic car auctions. 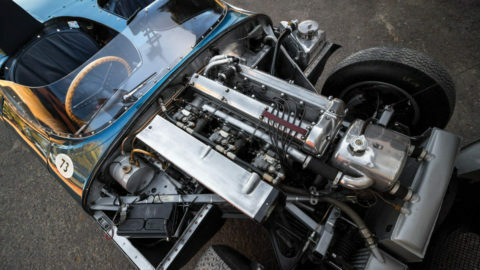 This Ecurie Ecosse Jaguar racing car is likely to set not only new marque record but also become the most-expensive British car ever sold at public auction. It is the only Le Mans-winning Jaguar C or D-Type to have survived intact in its original racing form. The 1955 Jaguar D-Type, chassis XKD501, that won the 1956 24 Hours of Le Mans race outright as an Ecurie Ecosse entry will be the headline car of the RM Sotheby’s classic car sale on August 19-20, 2016 in Monterey, California. No estimate has been released other than this Jaguar should comfortably eclipse the current record paid for a British car at public auction. 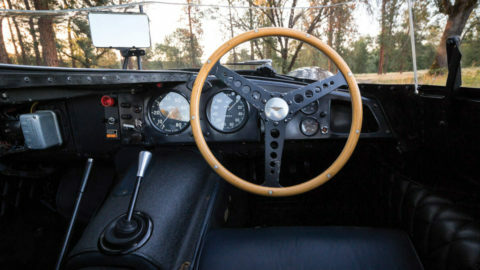 The current record for the most-expensive British car ever at public auction was set at $14,300,000 by a 1962 Aston Martin DB4 GT Zagato at the RM Sotheby’s 2015 New York Driven by Disruption sale. The current record for a Jaguar is $13,200,000 paid for a 1953 Jaguar C-Type Works Lightweight at the 2015 RM Sotheby’s Monterey 2015 sale. This C-Type finished fourth at Le Mans in 1953. Only three British cars have ever been sold for more than $10 million at public auction. The 1955 Jaguar D-Type, Chassis XKD501, was the first D-Type delivered by Jaguar to a privateer team. 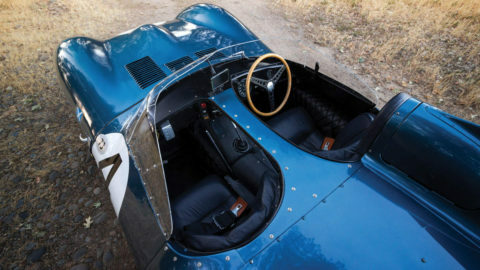 It famously claimed the overall victory at the 1956 Le Mans 24-hour race for the Ecurie Ecosse team when the three Jaguar Works cars failed to finish the race. Born to succeed the famous Jaguar C-Type’s dominance at Le Mans in the 1950s, the D-Type had purposeful and beautiful looks, pioneering engineering and outright fire power. In its day, no-one had seen anything like the revolutionary curved body penned by Malcolm Sayer. Not only was the Jaguar D-Type beautiful, it also was the first to incorporate a unique monocoque construction, combining the body and frame to form structural integrity. Its 3.4-litre engine was rated at 245bhp, propelling the car to a blistering 169 mph at Le Mans during testing. The immensely significant Jaguar D-Type on offer, chassis no. XKD 501, was sold new to Ecurie Ecosse and dispatched on May 5, 1955; it was easily identified as part of the famed Scottish racing team’s stable by its signature Scottish Flag Metallic Blue livery with the St. Andrews cross emblazoned on the front fenders, a guise it continues to wear to this day. Designed to excel in the crucible of motorsport, the car’s greatest performance was registered at the famed 1956 Le Mans 24 Hours, where, piloted by Ninian Sanderson and Ron Flockhart, it competed alongside three factory longnose cars. By the race’s final lap, only 14 entries remained in the field with the Ecurie Ecosse D-Type going on to claim a comfortable victory, having averaged 104 mph for over 2,500 miles. The car later went on to race at Goodwood, Aintree and the 1957 Mille Miglia, prior to being retired from competition in June that year. Since retirement, XKD 501 has been in the custodianship of just three private owners and has been meticulously maintained. A part of one of America’s most respected collections since 1999, it has been featured at many of the world’s leading concours events, including the 2002 Pebble Beach Concours d’Elegance, where it won the Jaguar Competition class and the Road & Track award. “XKD 501 is without question one of the world’s most significant competition cars,” comments Shelby Myers, Car Specialist, RM Sotheby’s. “It has an incredible racing pedigree, having won the most grueling contest in sports car racing, the famed 24 Hours of Le Mans, and importantly, is without any stories.